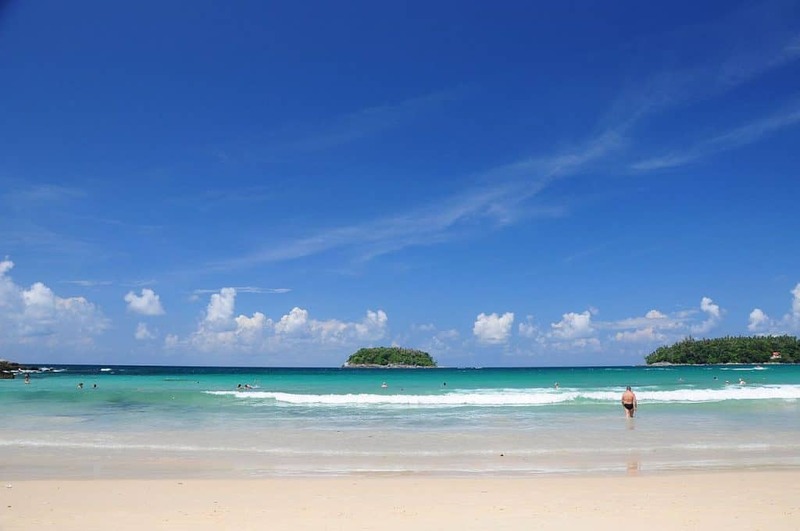 Kata Beach is without a doubt one of the most popular beaches on the West Coast of Phuket. After Patong beach and a few others, it is a beautiful destination for family vacations. Located in between two beach communities, Kata Beach is about 17 kilometres from Phuket Town and 47 kilometres from Phuket International Airport. Known for its calm waters and incredible blue sea, Kata Beach is a lovely island standing in the middle of the bay that makes an excellent location for pictures at sunset. Kata Beach has become a growing choice for nightlife, hotels, restaurants, shopping, spas and fitness centres and is home to annual Kings Cup sailing regatta. Swimming? Take note of the Lifeguards. 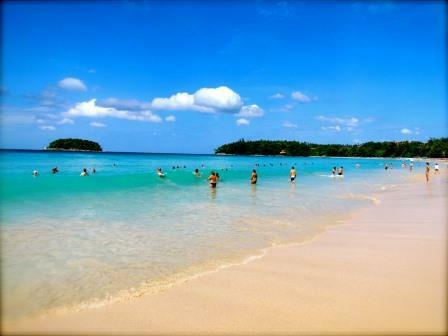 The best time to visit Kata Beach is between November and April because the beach is calmer and crystal clear. May to October, is a period to enjoy the waves, there is always a special price for accommodation during this period because the number of visitors is usually lower. High Season and the beach is calm but PLEASE do take notice of the Lifeguards Flags. Swimming at Kata Beach is normally safe for children and first-time swimmers. However, there are days when the Lifeguard red flag fly with warning signs on. You shouldn’t enter the water due to dangerous rip tides. 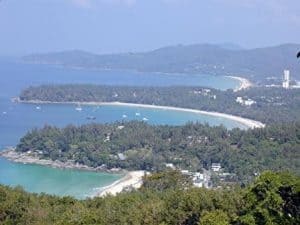 The beach at Kata has shaded areas, Kata itself is full of beach massage parlours and street vendors who sell a great variety of snacks and drinks such as ice-creams, fresh fruits, sarongs, sunglasses, and beachwear. The far south of Kata Beach is best for families with little children because becomes shaded later in the day. There are all sorts of accommodation available from the simple to the more luxurious. Karon Viewpoint formerly known as Kata viewpoint is one of the most visited viewpoints in Phuket. Located between Nai Harn and Kata Noi beaches. Go take in the view of Karon Beach, Kata Beach and Kata Noi while standing at Karon viewpoint. You will need transport to get up there. The viewpoint is usually is a centre for tourist attraction, most tourist prefers viewing the northern region because of its undeniably impressive eight-kilometre vista of the three west coast beaches. The Surf House Phuket is an artificial wave sport in Phuket. Every surfer dreams to visit the surf house because it is a place where you can ride the waves daily not minding the weather conditions. The surf house Phuket is also a place where you could learn the basics of surfing and wake boarding without the usual stress associated with it. The Surf House Phuket has two parallel high pressed water streams that flowing at a very high speed that could create a sufficient lift for a person. The water is just 10 centimetres deep, and the bottom is soft making any fall painless and impressive. Located in Kata Beach, Dino Park Mini Golf is a favourite spot for families and friends. Dino Park Mini Golf has a full 18-hole course which runs through a Jurassic Park-like setting, with giant and life-like dinosaurs around each hole. Kata Temple is also known as Wat Kata. The Kata Temple houses the statue of Lord Buddha, monks’ dormitories, a monastery pavilion, and a primary school on the same grounds. The temples were built in 1832 and have been continuously renovated and maintained. The temple is an impressive sight to visit with fresh colour paintings throughout most of its buildings. To the South of Kata beach is one of the the most beautifully designed luxurious Phuket hotels in Phuket. Kata Rocks is more than just a hotel; it is an unforgettable holiday experience for anyone visiting Kata Beach. Finally, Kata Beach and Kata Noi (North) beach is a must-visit for anyone who is looking for a place to spend his or her vacation. The beach has a lot of activities that would make your vacation an unforgettable experience.